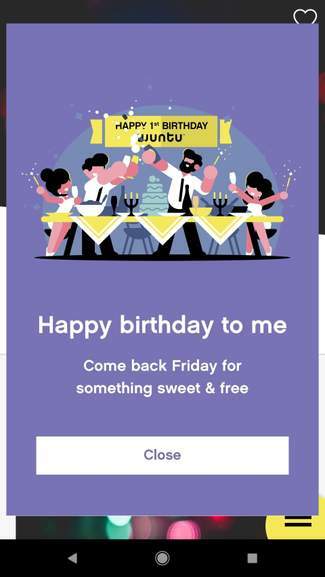 Just popped up on my Wuntu app - they're celebrating their 1st birthday with something "sweet and free"
Can only be one thing really... HandyCandy! Edit: it's not HandyCandy, but it is a free cake and drink at Patisserie Valerie! Enjoy everyone (when it goes live on the app)! I've had this issue with Wuntu that although it shows the code when I try to redeem the counter guy tells me there is no balance on my app. I am with 3 thru freedom app. Anybody else facing this issue? I've had this issue with Wuntu that although it shows the code when I try …I've had this issue with Wuntu that although it shows the code when I try to redeem the counter guy tells me there is no balance on my app. I am with 3 thru freedom app. Anybody else facing this issue? which offer were you redeeming ? The issue must be the 'through Freedom App' part. Does anyone else find their offers don't update til the afternoon, doesn't matter for most things , but the limited offers like sweets and face packs etc have always gone by the time mine updates. Frustratingly I get the little message at the top of my phone come through but the app doesn't give me the new offers at the same time . Phone is dual sim though so wondered if it might be something to do with that ? Does anyone else find their offers don't update til the afternoon, doesn't …Does anyone else find their offers don't update til the afternoon, doesn't matter for most things , but the limited offers like sweets and face packs etc have always gone by the time mine updates. Frustratingly I get the little message at the top of my phone come through but the app doesn't give me the new offers at the same time . Phone is dual sim though so wondered if it might be something to do with that ? Best to turn your phone off/on about 7.50. Handy Candy haven't released any marketing material, I suspect Three will give out a clue on there Social channels some point today. But I feel its pointing to Handy Candy, which is exciting! Thank you for the heads up Eden0032. Is there anymore info .. been on my app but didn’t receive a birthday notification. Nothing on there for me!!! Nothing on the app for me either - hope it's update soon as I'm currently abroad and. Flying home today! Just seen this - free cake & drink at Patisserie Valerie - but not showing on app yet. Ohh cake is better than handy candy. I'm a bit excited now lol. You are not with three you are with FreedomPop. The app will only work with those who have a three contract.